Raymond Mark Searage (born May 1, 1955) is a former relief pitcher who played for the New York Mets (1981), Milwaukee Brewers (1984–1986), Chicago White Sox (1986–1987) and Los Angeles Dodgers (1989–1990). He is currently the pitching coach for the Pittsburgh Pirates. In 7 seasons he had an 11–13 win-loss record with a 3.50 ERA. He appeared in 254 games, pitched 287 ⅔ innings, finished 101 games, and garnered 11 saves. Searage allowed 267 hits, 120 runs, 112 earned runs, 22 home runs, 137 walks (23 intentional), 193 strikeouts, hit 3 batters, made 14 wild pitches, faced 1,242 batters, and balked twice. He played college baseball at West Liberty State College, and signed with the St. Louis Cardinals in 1976. In December 1979, he was traded to the New York Mets for Jody Davis. In his brief tenure with the Mets in 1981, he had a 1–0 career record and went 1 for 1 in his only at bat, making him the only Met in history to have a 100% winning percentage and a 1.000 batting average. While with the Brewers, he had a streak of 28 consecutive scoreless innings pitched from 1984 to 1985, which tied a team record. He then played for the White Sox and Dodgers until 1990. He was the pitching coach for the Triple-A Indianapolis Indians. On October 17, 2009 he was promoted to the Pittsburgh Pirates and was named interim pitching coach for the Pirates in August 2010. 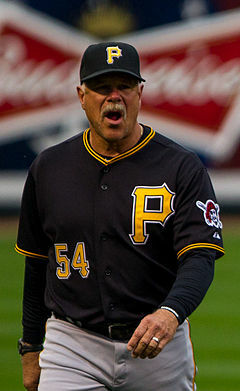 After Clint Hurdle was named manager, Searage was named full-time pitching coach. ^ "Ray Searage Statistics and History". Baseball-Reference.com. Retrieved March 23, 2014. ^ "The Ballplayers - Ray Searage". Baseball Library. Archived from the original on September 22, 2015. Retrieved March 23, 2014. This page was last edited on 12 April 2019, at 01:51 (UTC).